Clinton Street Baking Company - considered as "New York's #1 Breakfast Spot" by Lonely Planet- was once a small wholesale bakeshop started by husband and wife Chef Neil Kleinberg and DeDe Lahman. They had a few neighborhood patrons until their pancakes took NYC by storm! 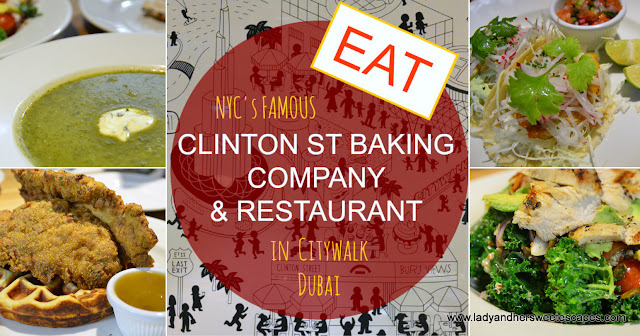 Today, Clinton Street Baking Company has 5 branches - one in New York, one in Singapore, one in Tokyo, and two in Dubai! Yes, Dubai residents are lucky to have a Clinton Street in Burj Views and in City Walk; while in other cities, diners need to queue to get a table! Ed and I visited the newly-opened branch in City Walk for dinner last Thursday. The location is distant from City Walk's central plaza; hence it's perfect for those who want to devour their comfort food away from all the bustle. The restaurant has a cozy and humble atmosphere - exactly what Clinton St is famous for. It has an open kitchen where diners can actually see the food preparation. I love the transparency! The kitchen is clean and the chefs are pros. They got nothing to hide, obviously. The staff are friendly and knowledgeable. It took quite sometime for the food to arrive, but glancing at the open kitchen, it was an assurance that we'll be devouring freshly-prepared dishes! As I was nursing a bad cough, I had to say no to Clinton St's shakes. There are 9 tempting varieties; all made with homemade organic ice cream! I said I'll save a summer day for the Maple Butter Pecan shake, and have the Mint Lemonade instead. Ed, on the other hand, had the House Lemonade. Both our drinks have an "old-fashion" vibe; exactly what we wanted! Pure and classic, not preserved and artificially flavored. Now, it's time to EAT! Knowing that we'll eat to our hearts' content that evening, we gave our dinner a healthy start with Kale and Quinoa Salad and a bowl of Market Soup of the Day which is also predominantly made of kale! Kale invasion right there! But you know, we can never have too much of the healthy stuff. It's actually great to know that the bakery known to offer goodies made with love and butter can also cater food to health-conscious people. The salad is a SUPER bowl of nutrient-rich food: quinoa, cherry tomatoes, avocado, spiced pumpkin seeds and organic kale tossed in lemon vinaigrette and topped with grilled chicken. The soup is a hearty and creamy blend of kale and sour cream. The portions are enough for two people to share, and we consumed everything until the last teeny-tiny quinoa seed. Our clean plates and soup bowl silently screamed how much we love 'em. Informed by our server that most main dishes at Clinton Street Baking Company are made for sharing, we opted to take a light dish and a carbo-loaded one. First up was the Market Fish Tacos. One serving has two soft-shell corn tortilla filled with radish and cabbage slaw, pickled onion, jalapeno sour cream and marinated char-grilled fish. It was served with pico de gallo and lime slices on the side. When the tacos was recommended to us, our server said that this dish would fill our stomachs just right. And he's correct, the soft tortilla and the dressing are light, the veggies are fresh and the fish - the main ingredient- was thinly-sliced and perfectly seasoned. Next came Clinton Street's infamous Fried Chicken and Waffles. I love waffles. I love fried chicken too. But, I never had them all together before! I heard it's a well-loved combination in the US, and I couldn't wait to get my hands on it! Visually, it looks weird yet very enticing. It is a humongous serving of thick Belgian vanilla buttermilk waffles topped with Clinton Street's award-winning fried chicken fillets that are bigger than my hands, completed with a signature warm maple butter on the side. Taste wise, it is comfort food at its finest! Every bite started with a clash of flavors and textures and ends with a harmony of sweet/savory note. It is downright pleasant... to the taste buds and to the soul! Because the serving is huge, we only finished half of it. We took the other half home, and unexpectedly, it was still good in the morning. Stale waffles can usually be hard and dry, but Clinton Street's was still soft and fluffy! Here you go! Fried Chicken and Waffles! Clinton Street Baking Company has 2 for 1 vouchers at The Entertainer. Voucher is valid for main dishes and buttermilk fried chicken. All Day Breakfast is excluded. We were invited to dine at Clinton Street Baking Company in City Walk.